Rev. Bruce Goettsche (Union Church of La Harpe and the radio program God's Truth for Daily Living) has written five books (one was co-authored with his son, Rick Goettsche). 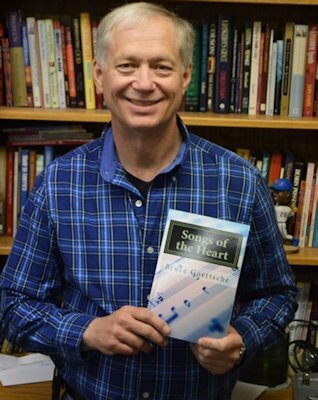 His newest book (after 9 years) Songs of the Heart is from the book of Psalms. Bruce says it is his most personal book, yet. In the introduction he writes, As I was working on this book my life came apart. Things happened I would have never dreamt possible. I was crushed, rejected, depressed, and feeling somewhat tossed aside by God. "I didn't lose my faith, but at times it was difficult to pray and to concentrate. "However, as I read through the book of Psalms again, I discovered a new depth and an incredible blessing. I recognized that the various Psalms were struggling with the same emotions I had. "I watched with wonder as these writers worked through their sense of abandonment and pain. "Suddenly the Psalms became the lifeline for my broken soul. Over and over (continuing to this day) I read the words of the Psalmists and they cut through me to speak to the core of who I am and who I long to be. Bruce says he wrote this book not to talk about his own hurt, but in the hope that others would find that same comfort from the Psalms that he discovered. In this book I focus on a variety of different Psalms. Some are informational and some are emotional. Some are angry and some are filled with joy. Each chapter has study questions to enable groups and Sunday School classes to better utilize the book. The book is available from Amazon in both paperback and Kindle editions. The Kindle edition is only $2.99. Bruce says, I wanted to make the book as affordable as possible so people would give it a chance. Bruce s other books are: Faith Lessons: Lessons in Faith from Genesis; Finding Your Way Through the Fog (Colossians); Joy: Finding it and Keeping it (Philippians); and Difficult People: Dealing with those who Drive You Crazy (co-authored with Rick).